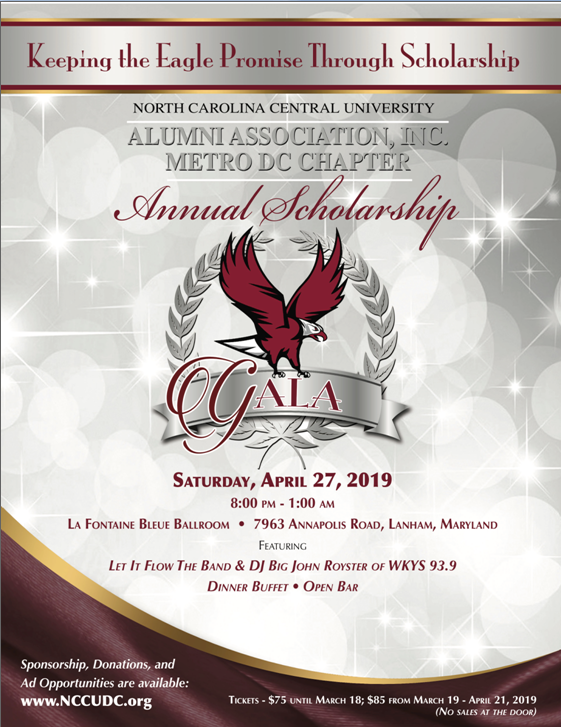 Known as the “Signature” event of the Metro DC Chapter, the Annual Scholarship Gala brings NCCU Eagles and friends of NCCU together in an atmosphere that is elegant, electrifying, and purposeful. Come join us for a night filled with dining, conversations, dancing, pictures, networking, and fundraising! At past galas, supporters come from near and far and we anticipate another year of entertaining our supporters again. We thank them for their continued support and belief in our vision to support students. The Metro DC Chapter is committed to do all it can to raise monies toward scholarships for students from the Metro DC area who choose to or currently attend North Carolina Central University. We are the ‘Sons and Daughters’ who are honoring our “Dear Old NCC.” We look forward to seeing you at this year’s gala! Hurry and purchase tickets while supplies last until April 21st, 2019! To Purchase Tickets and/or Donate, click HERE! To complete your Sponsorship and/or Journal Ad order on this site, pay for your sponsorship and/or Journal Ad by clicking HERE. Please fill out the form below to complete your Journal Ad order. Reminder: Please click HERE to complete your Sponsorship and/or Journal Ad purchase. If you want to mail your payment, use the address below and include your remittance. Metro DC Chapter/NCCU Alumni Assn. Donations: You can always donate online by clicking HERE. We love a CHEERFUL GIVER. Monies donated for scholarships support the Chapter Scholarship Fund at the University through the NCCU Foundation.